Daddy, But You've Got Hair Where You're Bald! 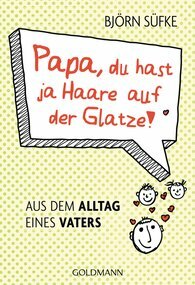 Original Title: Papa, du hast ja Haare auf der Glatze! Paperback, 224 pages, 12.5 x 18.3 cm, 4.9 x 7.2 in. How can you become a good father? Do you have to set limits at an early age, or can pinching toys from the wealthy neighbours' kids be counted as self-defence? Björn Süfke humorously demonstrates that being a father is one of the biggest adventures in the life of a man. His razor-sharp family stories are as affectionate as they are merciless and the result is a big book of encouragement for all fathers. After all, a father can take the place of a lot of things, but nothing can take the place of a Daddy.